Enrico Marchetti, destined to become one of the founders and most interesting makers of the modern Piedmontese school, was born in Milan in 1855. He apparently started his apprenticeship at the age of 14 with Luigi Bajoni (1838–95), who was perhaps the last of that town’s traditional violin makers. Later, Marchetti worked for a further few years in the shop of an even more obscure Milanese violin maker, Gaetano Rossi. The ethos of these two violin makers could not be further removed from the type of industrial violin manufacture practices that were already well established in parts of France and Germany and spreading. 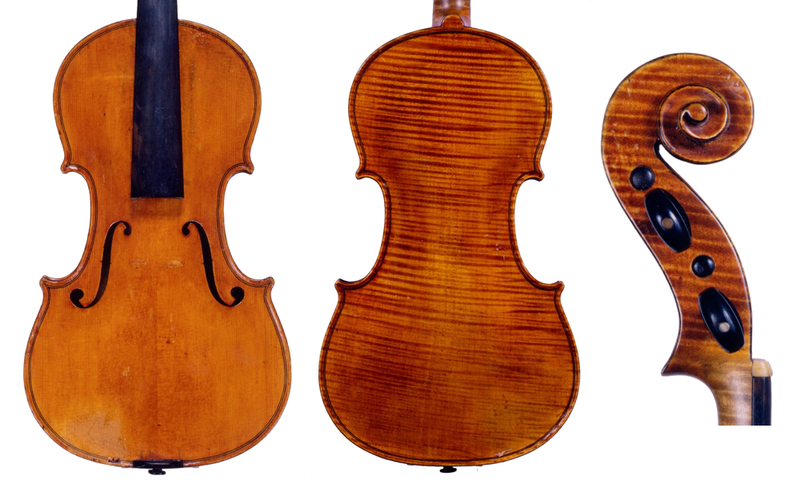 Before investigating Marchetti’s place in Turin’s violin making, let us pause and rewind to half a century before his arrival in the city in 1874. 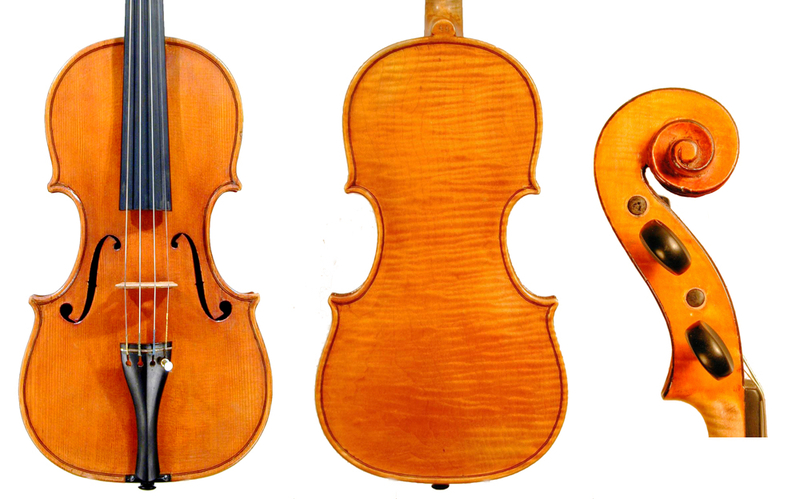 Nineteenth-century Turinese violin making stemmed from two main sources: one from the descendants of G.B. Guadagnini; the other from G.F. Pressenda (1777–1854), who arrived in Turin around 1815. Giuseppe Guadagnini (1736–1805), the principal violin making descendant of Giovanni Battista, pursued his career outside Turin. His siblings who remained in the city were evidently not nearly as assiduous about violin making as their ancestors; as a result the early 19th-century Guadagnini shop had moved away from violin construction, concentrating primarily on guitars. It was not until the time of Gaetano II Guadagnini (1796–1852) that fine violin making was re-established in the family, albeit on a much more modest scale than during the 18th century. 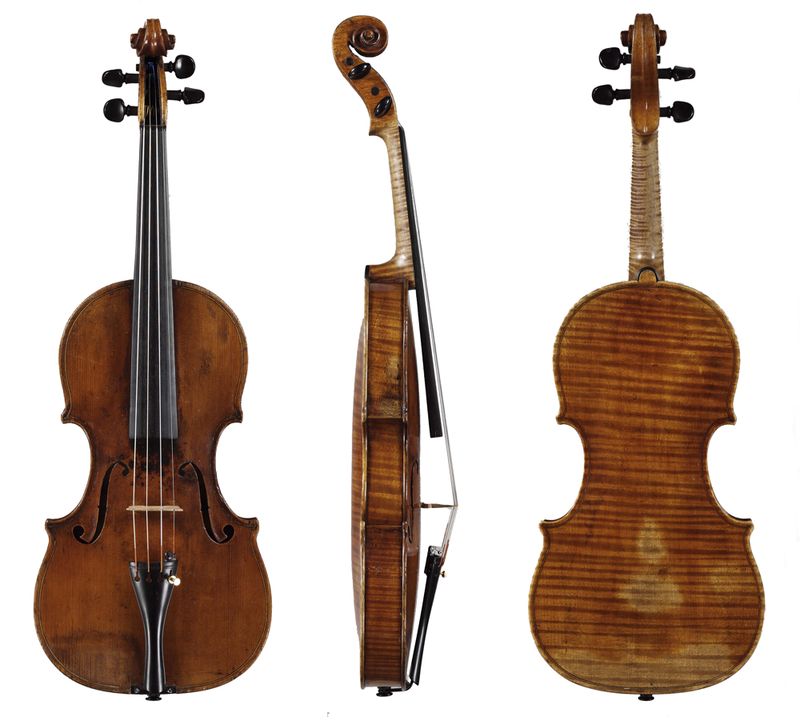 By the 1820s Pressenda had emerged as the finest violin maker in Italy, influencing nearly all successive Turin makers. Familiar with the French production-line methods from his training in the workshop of Nicolas Lete-Pillement, Pressenda became the first Italian maker since the days of Amati and Stradivari to possess the know-how to effectively delegate tasks to a number of apprentices. From 1834 those apprentices included Giuseppe Rocca (1807–65), who helped his master achieve an exceptional finished product. Alas, the beautiful instruments by Pressenda and Rocca would not bring either maker close to the kind of financial rewards enjoyed by their Parisian contemporary J.B. Vuillaume. Rocca left Turin in 1863, a poor man. By contrast the commercially focused shop of young Antonio Guadagnini (1831–81) prospered after Pressenda closed his doors in 1851. Mainstream violin making in Turin was starting to succumb to the Parisian approach of well-made but semi-industrial production. This trend was exemplified by the Guadagnini shop and another Turin dealership – that of Benedetto Gioffredo (1822–88). Gioffredo’s idol was Pressenda, whom he aimed to emulate. In this he was likely helped by his father-in-law, Pressenda’s friend and former workman Teobaldo Rinaldi (b.1805), whose family name Gioffredo later adopted for his own dealership, Gioffredo-Rinaldi. Both Gioffredo-Rinaldi and Antonio Guadagnini seem to have striven to replicate Vuillaume’s business model. They did so with a good measure of success, though they were unable to reinvigorate a generally sleepy ‘post-Risorgimento’ market sufficiently to challenge Vuillaume’s stature. In Italy it was not until the mid 1890s that Pressenda’s initial business model, fused with Vuillaume’s commercial ideas, would find its most efficient implementation with Leandro Bisiach in Milan. Arriving in Turin in 1874, aged 19, Enrico Marchetti was initially employed by Gioffredo-Rinaldi. A couple of years later he was working for Antonio Guadagnini. In these shops he was likely more occupied with repairs and the tasks of running a business, rather than with new violin making. In around 1878 he married Camilla (Petronilla) Uliengo, a union that made him a relative of both Gioffredo-Rinaldi and Romano Marengo. When Antonio Guadagnini died in 1881, his young son Francesco (1863–1948) took over the Guadagnini shop. That same year Marchetti was finally able to establish his own premises in central Turin as a maker rather than a dealer. His only competitors at that time, apart from the teenaged Francesco, who did not yet represent much of a threat, was Enrico Clodoveo Melegari (1835–95), an immigrant from Parma and Genoa who had been working in Turin for some time. Melegari’s interesting but intensely personal style never quite fit into the general Piedmontese mould and Gioffredo’s business was by then winding down. During the 1880s and early 1890s Marchetti was able to capitalize on the relatively competition-free environment in Turin. His son, the future violin maker Vittorio Edoardo (known as Edoardo), was born in 1882. By 1884 Enrico began participating in various exhibitions and competitions. That year he won a silver medal at the Turin General Exhibition and the following year more silver medals in Antwerp, Paris and Toulouse. He participated in other local and international exhibitions and by 1893 his labels proclaimed that he had won 12 medals; this had increased to 15 by the end of the 1910s and to 18 during his final years. He was perhaps not very modest about his achievements, but he was then indeed the most decorated of the Italian violin makers, with none of his other Turin contemporaries apart from Enrico Rocca mentioning any awards or medals on their labels. Sometime during the mid-1880s Marchetti trained Romano Marengo, himself a nephew of Benedetto Gioffredo and thus Marchetti’s relative by marriage. By 1888 Marengo had taken over the Rinaldi shop, elevating it to prominence; this was probably in part due to his connection with Marchetti. At that time the workshops of Rinaldi and Guadagnini were still the main forces in Turin. Marengo himself made some good instruments that can be termed Marchetti school. By 1918 Marengo was employing Edoardo Marchetti, who it seems made all or most of the Rinaldi instruments from 1920–25, and was probably also marketing instruments by Enrico, who was still highly active. In around 1892 Carlo Oddone, previously trained by Giofreddo Benedetto and F.W. Chanot, and strongly influenced by the Rocca model, began his excellent production. The quality of his work would only be equalled by Annibale Fagnola close to a decade later. They were part of a younger group of superb violin makers, also including Giorgio Gatti, who entered the city’s violin making arena towards the turn of the 20th century. They were followed by Emilio Evasio Guerra as well as Fagnola’s pupil Riccardo Genovese, Plinio Michetti and Anselmo Curletto. Most of these makers were strongly influenced by Marchetti at the start of their careers. In 1893 the Marchettis moved 40 km north to Cuorgné – a small town at the foothills of the Alps – where Enrico could concentrate entirely on his fine production. Eventually, with the help of the young Edoardo, the quality of his work improved markedly and the quantity also surged. Edoardo seems to have taken a long break from violin making, but by the early 1920s he had matured into a good independent violin maker until his premature death in 1926. Throughout the Cuorgné years Enrico maintained a strong connection with Turin, sometimes working there for prolonged periods. In 1909, while living in Turin, he lost his wife of 31 years. However, he remarried shortly thereafter and by 1912 he appears to have once again made Turin his main location. Turin was at this point turning into one of the busiest centers of fine instrument manufacture, with no fewer than eight excellent violin makers and their workshops active in the city. Marchetti’s own return to Turin indicates a strengthening demand, both local and foreign, for master-made Piedmontese instruments. It is difficult to say whether Turin’s production ultimately surpassed that of Milan, either in quantity or quality, but if value is an indication, instruments by Fagnola and Oddone command higher prices than most by their Milanese contemporaries, with Marchetti’s best work not lagging far behind. Enrico Marchetti died in 1930 in Turin, having outlived Edoardo by four years. Enrico Marchetti’s work ranges in quality from some of the era’s best and most inspired instruments to late-period examples that are so indifferently made that the contrast in quality and appearance can be staggering. His opus may be divided into four periods, the first lasting roughly five years from around 1881. These rare instruments, bearing his original labels (sometimes also branded internally ‘E. Marchetti Torino’ or below the end button ‘E.M’), are strongly influenced by Gioffredo Benedetto’s workshop and exhibit a rather commercial aspect. Violin making was not then yet Enrico’s main occupation, with repairs probably forming the bulk of his work. 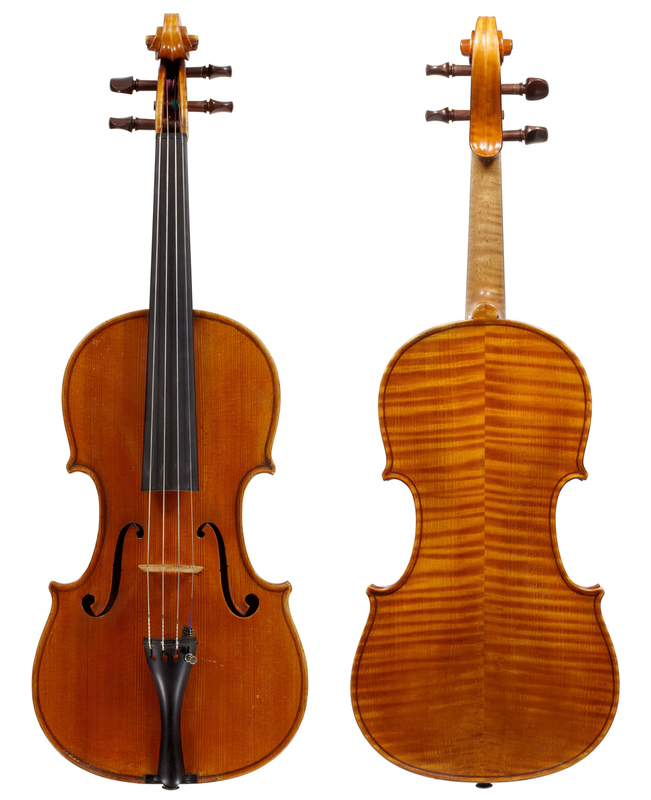 These instruments, generally built on a large Stradivari pattern, lack the Italian character so prevalent in his later work but show some clean workmanship and sport attractive materials of non-Italian origin, as well as a hard varnish that is quite uncharacteristic of his later work. They make one wonder whether Marchetti made them himself or whether he only finished instruments supplied to him by the Rinaldi shop. His second, experimental but most interesting period lasted from roughly the mid-1880s until around the beginning of the 20th century. These instruments are also relatively rare but are surely the ones that earned him his awards. Perhaps in a reaction against the type of violin making he had witnessed in the Turin workshops of his former employers, Marchetti suddenly adopted the free Italian style that he would have seen in his youth at Bajoni’s in Milan. Progressively improving aesthetically, these instruments are quickly but quite carefully made; they are also distinctive and expressive. 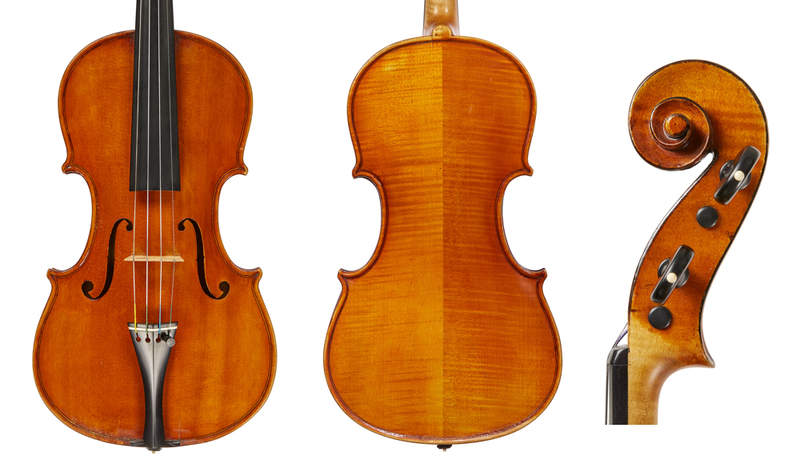 In their model, the positioning of the f-holes and their arching concept they recall Rocca’s interpretation of the Stradivari ‘Messiah’ model; their oil varnish is rather transparent, generally light or deep orange. In short these instruments have little in common with those from his earlier period. Stylistic innovations from this time include elongated corners that carry the wide and slightly uneven purfling as far as possible into the corners before ending with a long bee-sting. 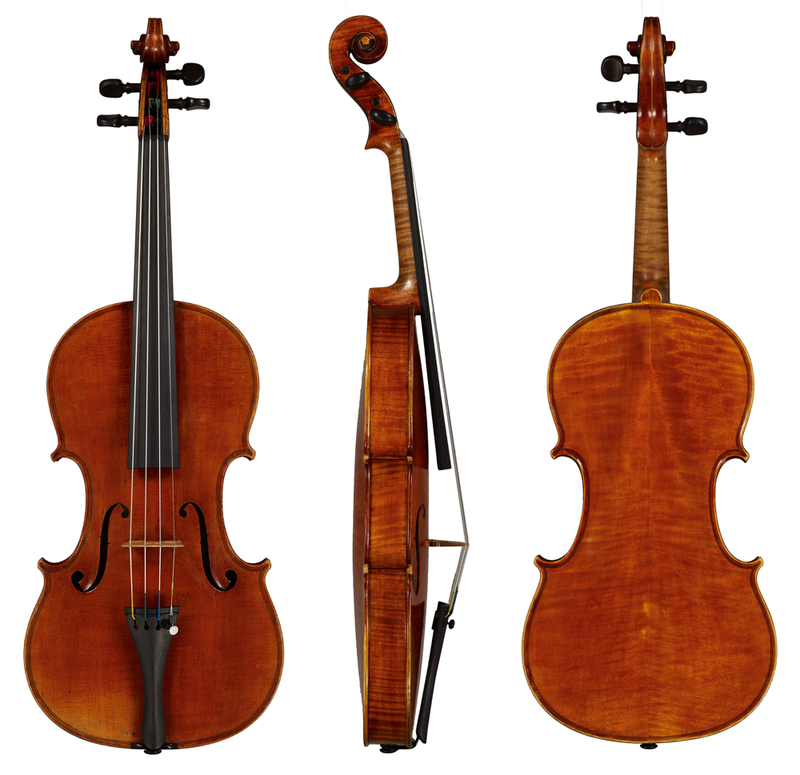 Some models are less eccentric and more in line with the Strad–Rocca pattern. Soon Marchetti succumbed to the influence of G.B. Guadagnini’s late work. This model continued to absorb him throughout his career – far more so than most of his colleagues in Turin, who generally preferred to follow Pressenda and Rocca. For this model Marchetti shortened and widened his corners considerably. Stradivari’s final and perhaps most powerful f-hole design, with beautifully fluted but short, stubby wings, which had inspired Guadagnini at the end of his career, also attracted Marchetti. He was never as concerned with elegance as he was with a model that yielded a powerful, projecting tone. He continued slanting the f-holes in his usual manner, often placing them in a rather low position. The strong, rounded scrolls, outlined with a black chamfer, show great personality and are very much in keeping with Guadagnini’s late prototype. During this time Marchetti also seems to have made copies, sometimes using old wood and antiqued varnish. There are some fairly convincing Rocca copies. On rare occasions he successfully emulated Pressenda and, still more infrequently, Testore and Gagliano. His wood choice both for spruce and maple is excellent. In the early 1900s Marchetti’s production entered a third period. He ceased experimenting, settling on the signature Guadagnini model that he more or less adhered to for the next 30 years. The color of these instruments varies, moving away from the orange and light browns associated with Rocca’s instruments in favor of darker, reddish-brown shades; the varnish also becomes somewhat pastier and heavier. Although during this period he normally maintained a high quality of output, already some instruments show signs of hasty execution, foreshadowing the type of making that soon followed: a deeper and more roughly made channeling and the widely positioned, slanting f-holes displaying a model that could be seen as a fusion of G.B. Guadagnini and ‘del Gesù’. From around 1915 Marchetti’s instruments tend to become stiffer, heavier and rougher – sometimes almost to the level of caricature. They exaggerate most of the features from the previous period, while gradually sacrificing the standard of both the woodworking and the varnish texture in favor of increased production. The buttons on the backs become accentuated with deep nicks where they meet the body of the instrument and protrude above the purfling, which is generally laid quite far from the edge. The scrolls are rounded and sturdy. The arching can be abnormally high and rather stiff, though some flatter and better-made late instruments exist. The varnish, often quite thickly applied, lacks oil and is glossy. Perhaps Marchetti’s vision and judgement was worsening, but no hand other than his is yet perceptible. The maple remains of good quality, while irregularly grained spruce prevails. At some point during the 1920s Marchetti taught Anselmo Curletto, who assisted him during his final years. Those examples in which Curletto’s hand is more evident vary substantially from the rougher instruments. Marchetti changed his labels at least three times during his career. The final one states that he had obtained 18 medals in exhibitions and bears his round logo with the letters ‘M.E.T.’ and a lyre above them. All his labels state that he originated from Milan (‘Mediolanensis’). He made some violas, a good number of excellent cellos, some double basses, mandolins and guitars. His 50 years of consistent production must have yielded instruments numbering in the high hundreds. It seems that by 1918 Edoardo Marchetti, whose other interests had previously taken him away from the bench, had resumed violin making, working independently and prolifically. His personal instruments follow those of Enrico in their distinctiveness and originality; they are more delicate and slender waisted with his father’s low f-hole setting; their smaller and less bold scrolls are also somewhat less artistic yet better finished than his father’s and his attractive varnish retains a soft texture, while Enrico’s hardens. The violins he completed from 1918 are in some ways better made and more attractive, with their pretty wood and neat purfling, than those by his ageing father from a similar period, though his arching is, at times, pigeon-breasted. Eric Blot, Liuteria Italiana vol. IV, 1800–1950: 150 Years of Violinmaking in Piedmont, Eric Blot Edizioni, Cremona, 2001. Yasuno Toshitake and Robert Weindl, LiutaiWiki Blogspot.